Launching careers. Delivering top talent. Vault is the world’s leading source of career information and provides in-depth intelligence on what it’s really like to work in an industry, company or profession – and the advice you need to land that job. Search current jobs and internships, research a company, school or industry, get the inside scoop, and find the career advice you need to launch your career. 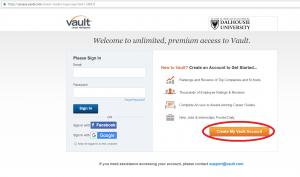 Why sign-up for an account with Vault? Get the information you’re looking for with industry guides and company profiles. Vault also provides extensive information on more than 840 professions. This includes education requirements, skill requirements, salaries, advancement prospects, and more. As the world’s leading source of career information, it will make your efforts at researching employers, industries and career subjects infinitely easier and more efficient. With thousands of advice articles on subjects ranging from interviews to cover letters and resumes, learn how to position yourself to launch and build the career you want. 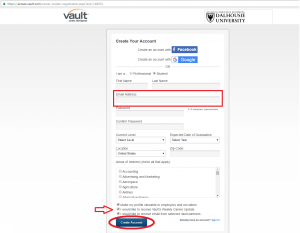 New jobs posted daily on Vault.com, and you can sign-up for posting alerts to have the latest jobs that match your search sent to you directly. Most importantly, receive this resource at no cost to you! Step 1: Head over to the Vault and click the orange “Create My Vault Account” button. 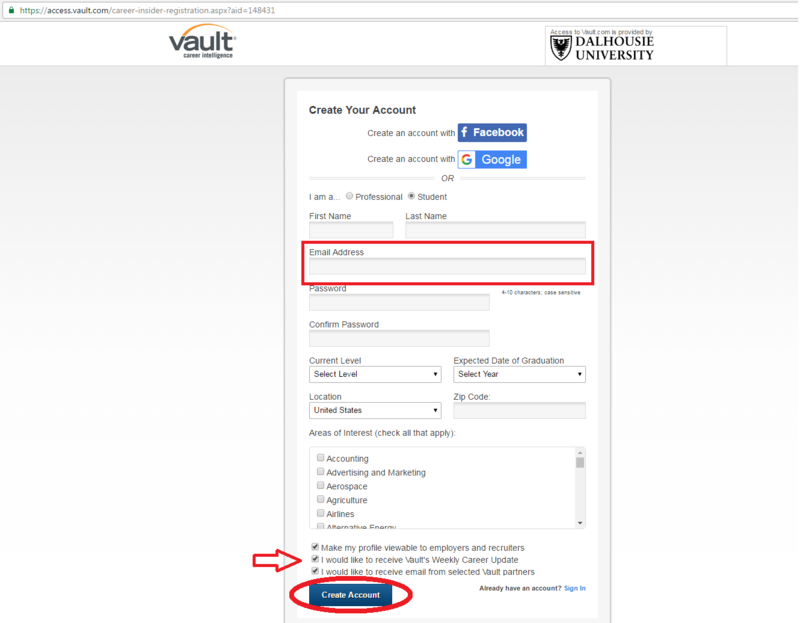 Step 2: Complete the fields below (using your Dalhousie email address), selecting whether you would like to receive Vault weekly updates. Click “Create Account”. Step 3: Click “Get Started” and discover all that this resource offers you. © 2019 Management Career Services | Launching careers. Delivering top talent.